Although the goals and procedures of statistical research have changed little since the Second Edition of Statistics for Research was published, the almost universal availability of personal computers and statistical computing application packages have made it possible for today's statisticians to do more in less time than ever before. The text features the most commonly used statistical techniques for the analysis of research data. As in the earlier editions, emphasis is placed on how to select the proper statistical procedure and how to interpret results. Whenever possible, to avoid using the computer as a "black box" that performs a mysterious process on the data, actual computational procedures are also given. 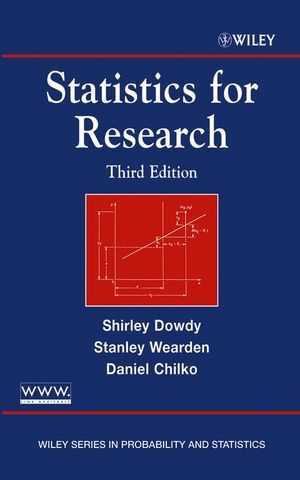 A must for scientists who analyze data, professionals and researchers who need a self-teaching text, and graduate students in statistical methods, Statistics for Research, Third Edition brings the methodology up to date in a very practical and accessible way. SHIRLEY DOWDY, PhD, has held appointments as Professor of Statistics at West Virginia University and Professor of Research Methodology at St. Louis University, where she was also the Dean of the College of Arts and Sciences and from which she is now retired. She received her PhD from the University of Notre Dame. STANLEY WEARDEN, PhD, is currently a professor in the Department of Statistics at West Virginia University in Morgantown, West Virginia, where he previously served for four years as Chairman of the Department of Statistics and Computer Science. He earned his PhD in population genetics from Cornell University and also held the position of Fulbright Professor of Statistics at the University of the West Indies. DANIEL CHILKO, MS, is an Associate Professor of Statistics at West Virginia University and has contributed his expertise to several books in the field. He received his MS from Rutgers University. 1. The Role of Statistics. 1.1 The Basic Statistical Procedure. 1.3 Experimental Data and Survey Data. 2. Populations, Samples, and Probability Distributions. 2.4 Random Variables and Probability Distributions. 2.5 Expected Value and Variance of a Probability Distribution. 3.1 The Nature of Binomial Distributions. 3.4 Nonparametric Statistics: Median Test. 4.1 The Nature of Poisson Distributions. 4.4 Poisson Distributions and Binomial Distributions. 5.1 The Nature of Chi-Square Distributions. 5.4 Relative Risks and Odds Ratios. 5.5 Nonparametric Statistics: Median Test for Several Samples. 6. Sampling Distribution of Averages. 6.1 Population Mean and Sample Average. 6.2 Population Variance and Sample Variance. 6.3 The Mean and Variance of the Sampling Distribution of Averages. 7.1 The Standard Normal Distribution. 7.2 Inference From a Single Observation. 7.3 The Central Limit Theorem. 7.4 Inferences About a Population Mean and Variance. 7.5 Using a Normal Distribution to Approximate Other Distributions. 7.6 Nonparametric Statistics: A Test Based on Ranks. 8.1 The Nature of t Distributions. 8.2 Inference About a Single Mean. 8.3 Inference About Two Means. 8.4 Inference About Two Variances. 8.5 Nonparametric Statistics: Matched-Pair and Two-Sample Rank Tests. 9. Distributions of Two Variables. 9.3 Inferences Related to Regression. 9.5 Nonparametric Statistics: Rank Correlation. 9.7 Estimating Only One Linear Trend Parameter. 10. Techniques for One-way Analysis of Variance. 10.7 Nonparametric Statistics: Kruskal–Wallis ANOVA for Ranks. 11.1 Random Effects and Fixed Effects. 11.2 Testing the Assumptions for ANOVA. 12.2 Randomized Complete Block Design. 12.4 a xb Factorial Design. 12.5 a xb xc Factorial Design. 12.7 Split Plot with Repeated Measures. 13.1 Combining Regression with ANOVA. 13.2 One-Way Analysis of Covariance. 13.3 Testing the Assumptions for Analysis of Covariance. 14. Multiple Regression and Correlation. 14.2 ANOVA Procedures for Multiple Regression and Correlation. 14.3 Inferences About Effects of Independent Variables. Answers to Most Odd-Numbered Exercises and All Review Exercises.